The FYFV was published in October 2014. The supporting strategies for maternity, mental health, cancer and primary care were published 2016. As a consequence, whilst PH&C 2020 covered all the right territory it was not closely aligned to the specific commitments we are asking the NHS to deliver. As the NHS has aligned around the key deliverables in the 2017 Next Steps document, we have aligned the IT programmes accordingly. NIB created a report with 10 domains, which is how we have structured delivery ever since. These domains covered aspirations – e.g. Domain A, Self Care and Prevention; specific clinical service areas – e.g. Domain B, Urgent and Emergency Care; and huge implementation objectives – e.g. Domain G, Paper Free at Point of Care. At a strategic level, these domains stood alone, but as we moved into implementation we have started to map and address the inter-relationships. The PH&C 2020 was written in the language of informaticians. Over the past year we have sought to develop a narrative that is more focused on the outcomes that we are trying to achieve, which we can explain to our patients and public. We have captured this into a “placemat” diagram, which we are now discussing with colleagues, that ties our objectives to the outcomes to the specific work that NIB is overseeing. The latest draft of this is at the end of this blog. We are going through a process with NHS Digital, the Department of Health and the Cabinet Office to realign the governance structure from the previous domains to the outcomes and projects on the placemat. To support through information and technology the delivery of the triple aim: better health for populations, better care for patients and lower costs allowing the NHS to do more for the money we have. To empower the person (and where appropriate their carer) to maintain their own health, manage their illness or recovery, and interact with the NHS in a way that improves convenience and effectiveness for the individual and their clinical team. To support clinicians in delivering high quality care at all times, as part of a network of professionals who can communicate easily with each other, with access to the patient’s records and care plan in at the right time and in a usable format, supported by the best in decision support and monitoring tools. To integrate services across health and care so that patients receive support and care in the place that is most convenient to them, maximises the ability of patients to maintain their health and their independence during illness, and enables monitoring and prediction so that problems and risks are identified and managed as quickly as possible. To manage the health system in a way that minimises the burden of data collection, brings together the data necessary for quality improvement and cost reduction, creates a single source of truth for decision making, and enables complex modelling and forecasting to enhance health and care planning. To create the future by enabling the NHS to be world leaders in genomics and its integration with healthcare, data driven clinical research, life sciences and the use of computing power to digitise knowledge. This will enable us to use machine learning to push forward the boundaries of medical science in a way that protects patients, embraces transparency and builds public confidence. These deliverables are underpinned by a series of infrastructure projects that are necessary to enable all of these ambitions. A secure network infrastructure that protects patient data from user carelessness and criminal cyber attack, ensuring the availability of critical systems in an NHS that is now dependent upon information technology to function, as was shown by the recent global cyber attack. A patient security layer that enables a patient to securely identify themselves and access the information the NHS holds on them, gives them the ability to control the circumstances under which the NHS can access their data, and makes it possible them to see who has accessed their record and thereby assure themselves that their wishes are being honoured. An interoperability architecture that enables real-time access to linked, deduplicated, normalised clinical records and personalised care plans for clinical care, can make an individual’s data available to them through browser or app technology or (with their agreement) for remote health monitoring, and can create de-identified versions of this data when appropriate for secondary uses such as clinical research and NHS operational management. An app ecosystem that will enable developers to create applications to use identifiable and non-identifiable clinical data and make those available to the public. Individuals would control whether they wish to have the NHS aggregate their personal data centrally and let an app access it, in much the same way as they can for banking and other personal details. I shall discuss some of these areas in more detail in future blogs. The delivery of this ambitious agenda is being led within NHS England by the IT team under Keith McNeil. Keith is the NHS’s first Chief Clinical Information Officer and apart from leading the team chairs the National Information Board (NIB), currently chairs the Digital Delivery Board (DDB) and attends the NHS Digital Board. Keith’s particular focus is on the use of IT by clinicians to improve patient care and the future potential of improved IT and genomics to improve diagnostics and precision medicine. Keith is leaving at Christmas to go back to Australia and we will be advertising to recruit his replacement very soon. Will Smart is the NHS’s Chief Information Officer and is the main contact in aligning delivery priorities with NHS Digital. He has particular responsibility for delivering the systems to be used by NHS staff for patient care and for the infrastructure programmes that make everything else possible. Juliet Bauer is the NHS’s first Chief Digital Officer. Juliet’s main focus is empowering patients and the public to manage their health and dealing with the NHS using digital technology. She is heavily involved in the redesign of care pathways in our clinical priorities using technology, and in creating an environment where innovators can create new technologies to support patients. Tim Donohoe is Chief Technology Advisor at the Department of Health and has the unenviable role of straddling the DH, NHS Digital and NHS England, overseeing the joint governance and helping to smooth some of the cross government workings. Tim also leads on the programmes related to creating management data. The relationships between the different organisations involved in delivering NHS’s IT strategy is complex, as many areas of our health service have now become. Department of Health holds almost all the funding for NHS IT. NHS England is responsible for the NHS’s IT Strategy which rests with me, as National Director for Operations and Information. NHS England then has three posts – CCIO, CIO and CDO (as described above) who have system wide accountability, which means that even though they are in NHS England, they have accountabilities to NHS Improvement, Public Health England and the other ALBs. Through those three and their teams, NHS England is responsible for setting the NHS’s IT priorities, describing the programmes, and commissioning them through NHS Digital. 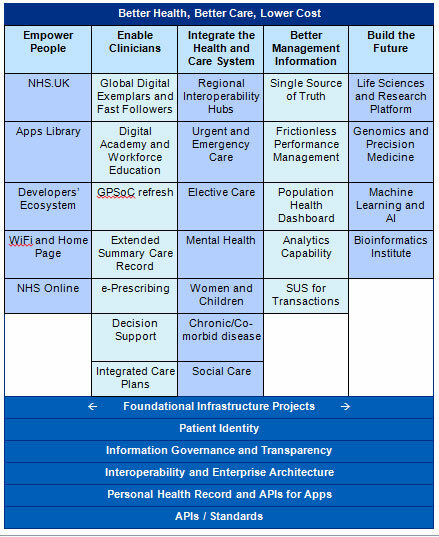 The DH then passes the money for these programmes to NHS Digital. NHS Digital is the primary delivery organisation. Their job is deliver the programmes agreed with NHS England within the budget allocated either through their own staff, by subcontracting to third parties or by awarding turn-key commercial contracts. Increasingly we, and NHS Digital, are seeking to pass money to providers and STPs to make local commercial decisions within the framework of the strategy and priorities we set nationally. NHS Digital also runs the major IT infrastructure like the NHS Network (N3) and NHSmail. Digital Delivery Board is the governing body through which decisions are agreed. It is currently chaired by the CCIO and has representation from DH, NHS E, NHS D, NHS I, Cabinet Office and Treasury. National Information Board is the stakeholder body through which all the ALBs, the NHS, suppliers and patient organisations get to have their say. It is also chaired by the CCIO. Initially it worked to create the over-arching strategy, but more recently it has been focused on specific themes like patient confidentiality, cancer and mental health. A five year allocation of £4.2 billion was made available in 2016 for information technology by the government. About half of this money was earmarked for existing programmes or their renewal, such as N3, NHSmail and GP systems, and the other half was available for the new programmes in the PH&C 2020 strategy. As is always the case, unplanned factors have made calls on this money, such as the urgent response to cyber security, and the allocation is subject to the same reductions due to productivity assumptions as other parts of government. In his report published in September 2016, the US clinician and academic Bob Wachter noted that the allocation provided was insufficient funding to achieve the strategy vision of a paperless, joined up NHS. This was accepted by the Secretary of State. We have taken the view that whilst it isn’t enough to complete the vision, it is enough to make a significant start and rather than going to the Treasury with our hand out, we should prove that the money we have can be transformationally spent and demonstrate that future investment in NHS IT is a good bet. I hope that this gives some sense of the strategy and structures through which we are trying to address NHS IT. As I said earlier, I intend to write a number of blogs explaining the strategy and this is the first. Please feel free to send in any questions that this blog may have provoked and we will do our best to answer them. 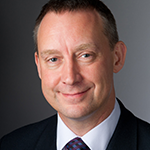 Matthew Swindells is NHS England’s National Director: Operations and Information. He joined NHS England in May 2016 from the Cerner Group and his role as Senior Vice President for Population Health and Global Strategy. Matthew is responsible for national performance of the NHS against the NHS Constitution Standards, assurance of Clinical Commissioning Groups, achieving a paperless NHS, information and technology programmes and investment in data. He has over 25 years’ experience in health care services and has worked in the Department of Health as a Chief Information Officer and as a Senior Policy Advisor to the Secretary of State for Health. Prior to this he served as a Principal Adviser in the Prime Minister’s Office of Public Service Reform. Matthew began his career at Guys and St Thomas’ Hospital in the early 1990s, and went on to become Director of Clinical Services of Heatherwood and Wexham Park Hospital and later Chief Executive of the Royal Surrey County Hospital, in the early 2000s. He is visiting professor and chair of the advisory committee in the School of Health Management at the University of Surrey and Member of the Editorial Board for the Journal of Population Health Management. We’re a local company based in the North West of England. And we’re currently working on a project with our own money to actually implement all of the above (in Phases). But we’re struggling to get in touch with people within the NHS to try and discuss the project and get help with regards to API’s etc. Any chance of helping or discussing? It is really useful to see the wider picture and how the national strategy fits together. I’m still concerned by Information Governance (IG) however and how it acts as an obstacle to undertaking quite legitimate tasks in the area of Business Informatics. Perhaps you could make it a feature of a future blog? Many thanks for really useful blog, Matthew. Good to know who’s who – and the simple top line message is very helpful. In the deliverables, I’d like to see more emphasis on the need for inter-operability with social care systems: essential if we’re going to realise the potential of STPs to transform health and care in their geographies. The draft placemat feels much too complicated, but depends who you want to read it.